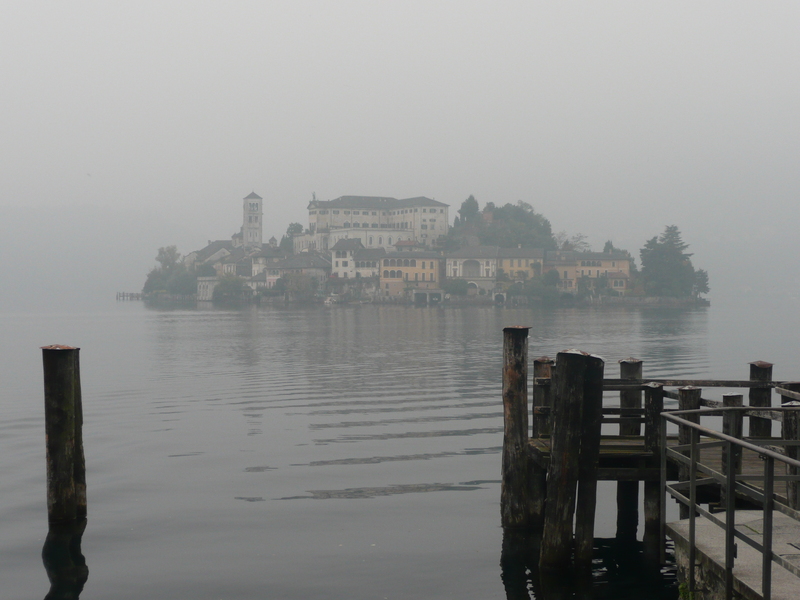 Isola San Giulio sits upon Lake Orta like a storybook fantasy, inviting you to imagine its history. As the dusk arrives in Orta San Giulio I am sitting by the pier gazing at the mystic island, thinking that I can almost see the monks walking peacefully around its pathways, silently in prayer. 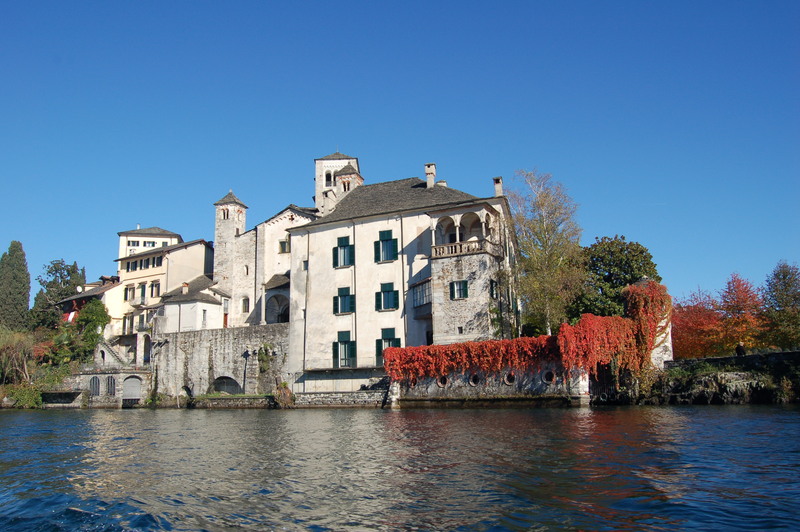 The most prominent feature of the island, the impressive Basilica of San Giulio was begun in 390 by San Giulio after–legend has it–he waved his hand and commanded the massive serpent to disappear. Although it was heavily damaged between 956 and 962 during the siege of Otto I, it was reconstructed over the years that followed and a beautiful tower was added during the 11th and 12th centuries. We pay our fare and board the boat that takes you there in just a matter of minutes. Because the journey is so short, the skipper takes the long way around, so that we can see the imposing villas that face the water. These elegant houses were originally the houses of the most important priests. Each was named for a saint. In June, Villa Tallone on the island hosts a music festival. We disembark and pass through the the opening in the city walls that encircle the island, up a flight of stone steps and into the Basilica itself. The interior is quiet and nearly empty. We notice the ancient frescoes, still well preserved. We also see the imposing structure of the pulpit, held high by four carved columns of dark green serpentine marble. At each corner there is a symbol of an evangelist: a lion for Mark, an eagle for John, an ox for Luke and an angel for Matthew. Just outside the Basilica, we enter the pathway that circumvents the island, making its way through narrow medieval passageways, occasionally opening enough to allow the sun to show off flowers and lush foliage. As we hike, we are aware of the monastery that occupies the center of the island, high above us and inaccessible. 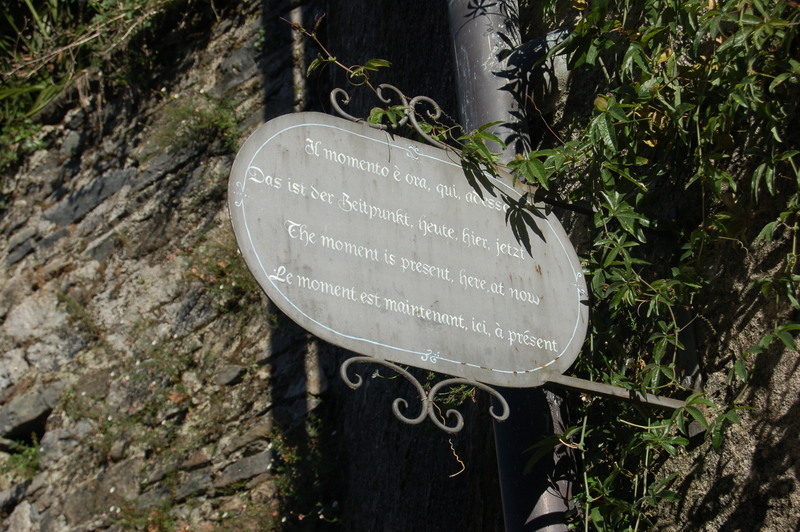 We are on the Walk of Peace, and from time to time we stop the read the aphorisms on the small signs just above us, offering a tranquil reflection in four languages. The message is clear. We walk a bit and find another. It doesn’t take long to walk all the way around an island that is only about 250 meters in diameter. We take a turn and find we are back at our starting point. We make one last short visit to the Basilica and then make our way to the pier. The October sunlight is warm on our faces. The skipper appears once again with his boat to take us back. 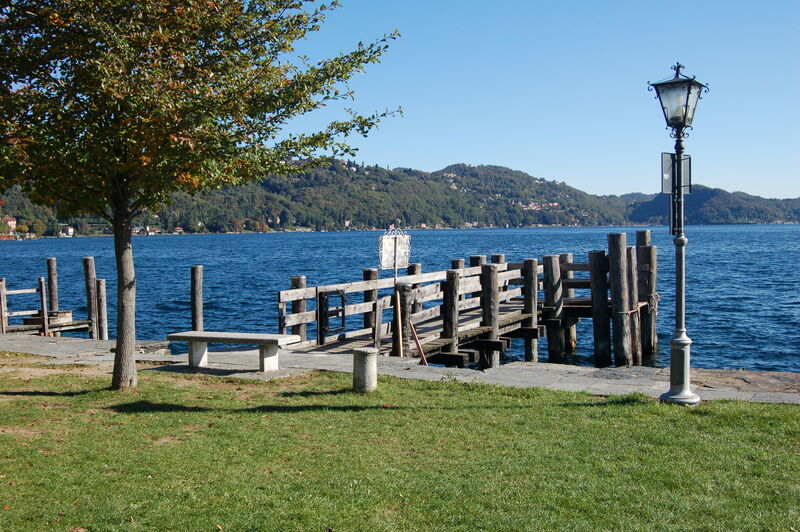 This entry was posted in 30 Days on the Road in Italy, Italy up close, The Lakes of Italy and tagged accommodations, isola san giulio, lago d'orta, lake orta, orta san giulio, rental, villa. Bookmark the permalink.